We had yet another incredible weekend just past with our Kaz Rodriguez Easter weekend takeover! 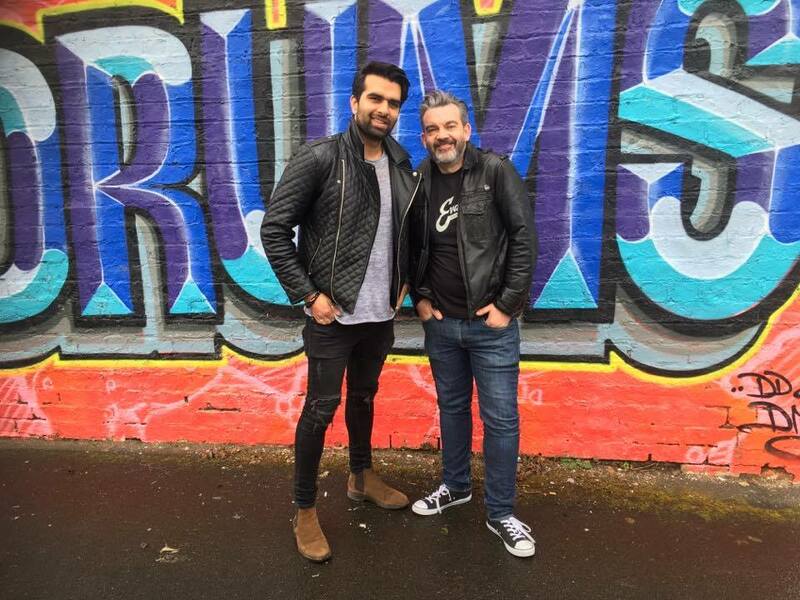 From the moment Kaz arrived at dD Drums on the Thursday. Arriving by car, with his kit in the back after driving 9 hours from London I could tell he was more than up for the weekend we had all planned. 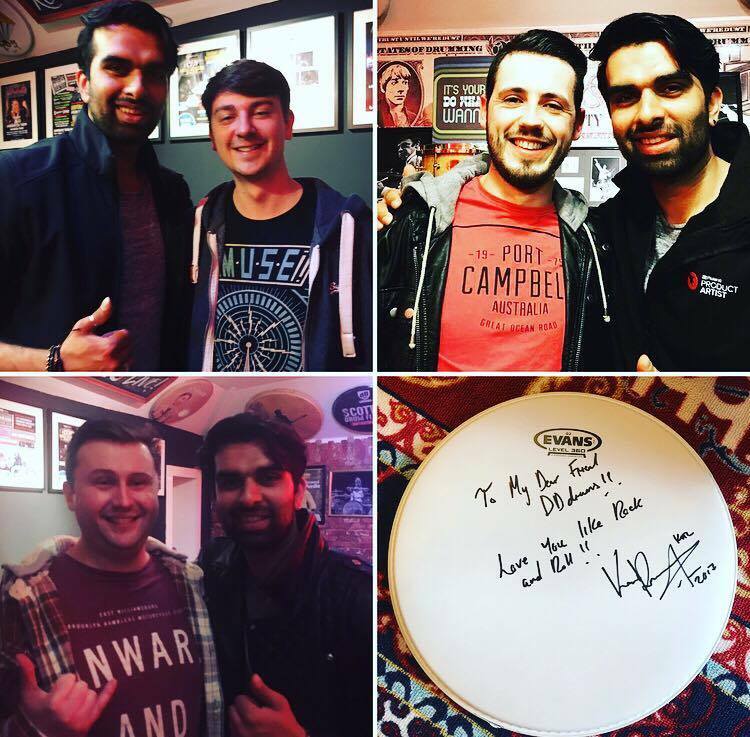 You may recall Kaz’s performance at the Scottish Drum Fest 2016? 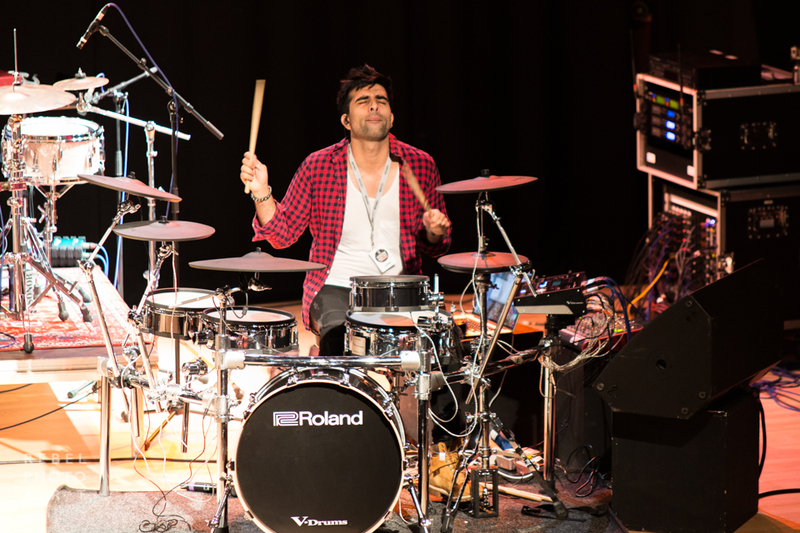 Kaz performing on the Roland TD-50 at the Scottish Drum Fest 2016. He was incredible on and offstage and really dug the dD Drums vibe, had a great time with all the gang and added massively to the warm special day we all created. Kaz and I stayed in touch and made a loose plan to arrange lessons at dD sometime in the future. On a late night message thread I just asked if he had any free weekends coming up and incredibly he was free the weekend of our Hybrid night – the rest just fell into place naturally. 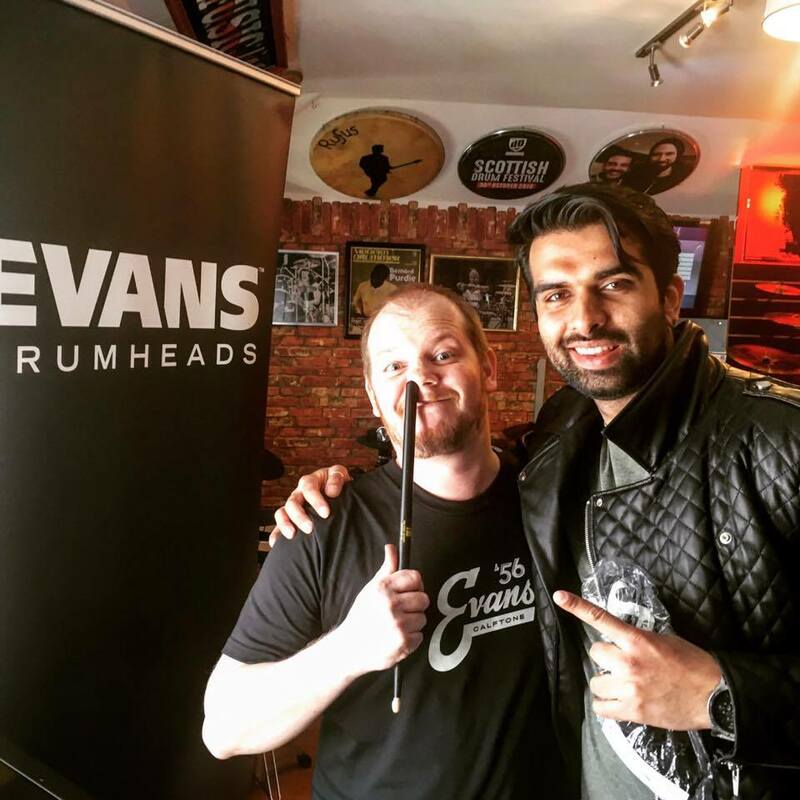 The cherry on top was hearing from one of dD Drums best supporters Ben Aldred of Evans Drumheads to see about hosting an instore Evans tuning session that weekend too! we knew we were in for a cracker! Ben Aldred of Evans Drumheads and Kaz Rodriguez. Here is a brief account of what went down over these unforgettable 3 days of nonstop Drum Vibe. On the Thursday night we had a cool gathering instore to see both the Roland Hybrid and Electronic kits on demo. An informal night with some top playing from both Kaz and Phil gave myself and good customers a demo of Rolands TM2 used with triggers on a cool Ludwig Breakbeats kit, Sampling and triggering via the SPD SX unit and various pedals and triggering options. 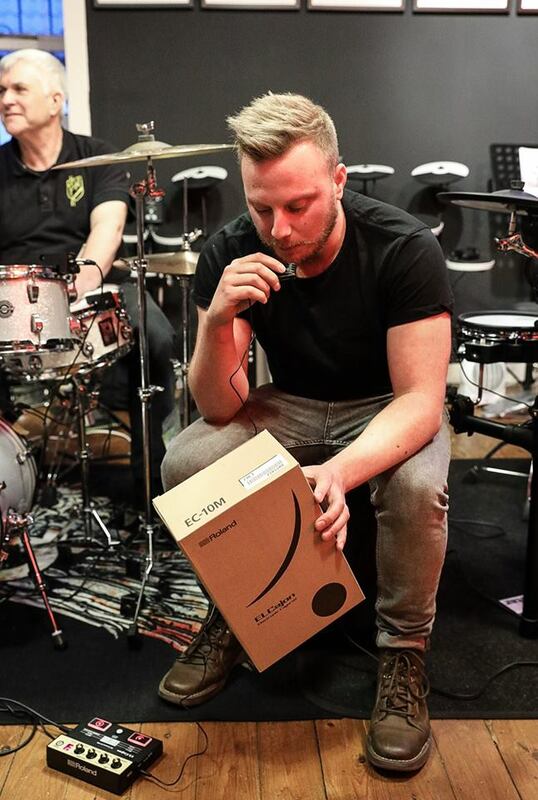 John Pullan himself demo’d the new genius Roland EC-10 M El Cajon attachment and box – including a bit beatboxing! 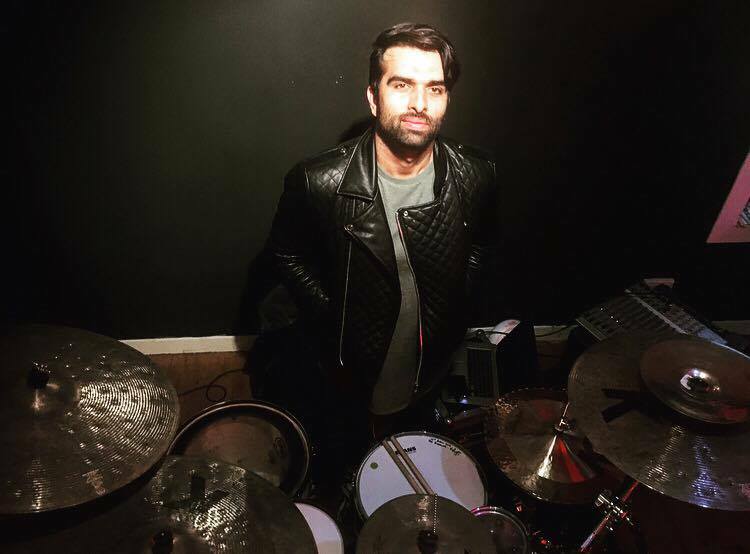 Kaz gave us the appetiser performance of the weekend showing us what was instore for us by playing some of his biggest hits from his playalong series on a Roland TD25 blowing us all away. Informed and inspired the dD gang then had the opportunity to have a chat with all the performers and a few photo ops too. What a fantastic start to the weekend it was. Roland product demonstrator Phillip Ragsdell getting Hybrid on it! On the Friday and Saturday daytimes Kaz was completely sold out for all One on One lessons. Teaching from the live kit studio at dD Drums on his own kit he was perfectly at home and made full use of the inhouse HK Audio rig to get musical as well as technical with his students. 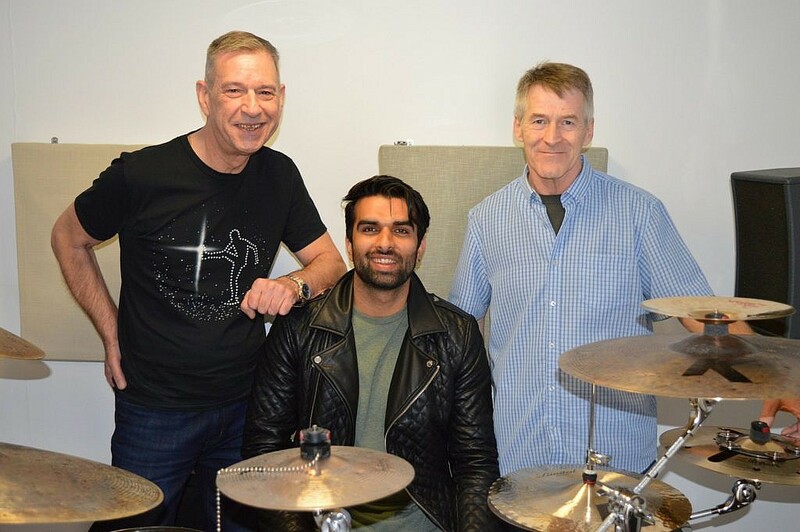 What followed was 2 days of incredible drummers making their way to greater fulfilment in their playing by learning from this great players experience and outlook on music/drumming. Kaz made a point of also offering all students the opportunity to play his very own Tama kit! Happy faces and enthusiasm was hanging in the air every hour on the hour as I had the unenviable task of ‘calling time’ on each lesson. The atmosphere in the shop afterwards was electric too as Kaz’s students shared their experience over a coffee in the shop. A couple of Tommy’s! Massive fans of Kaz these guys made their 1st dD visit! 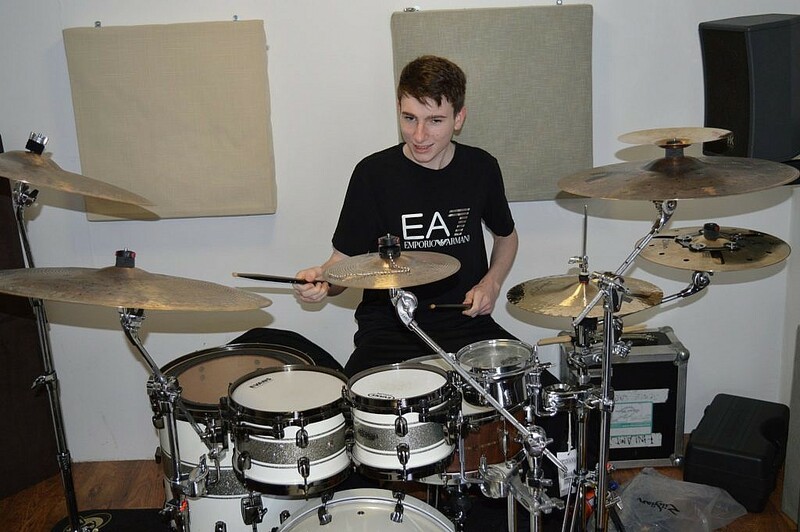 Craig Kendal enjoying Kaz’s Tama kit. Our bestie Chris and Kaz loving it! As planned our buddy Ben was resident all day instore doing his own brand of magic with his deep knowledge on all things Evans heads. Ben spent the day hanging, reheading, tuning and giving advice to all on how to achieve ‘their sound’. 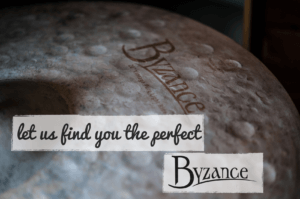 Including helping top young Scottish Drummer (from band Skipnish) Rory McGrindlay select the correct heads and get an amazing sound from his Scottish Handmade Murray drum. 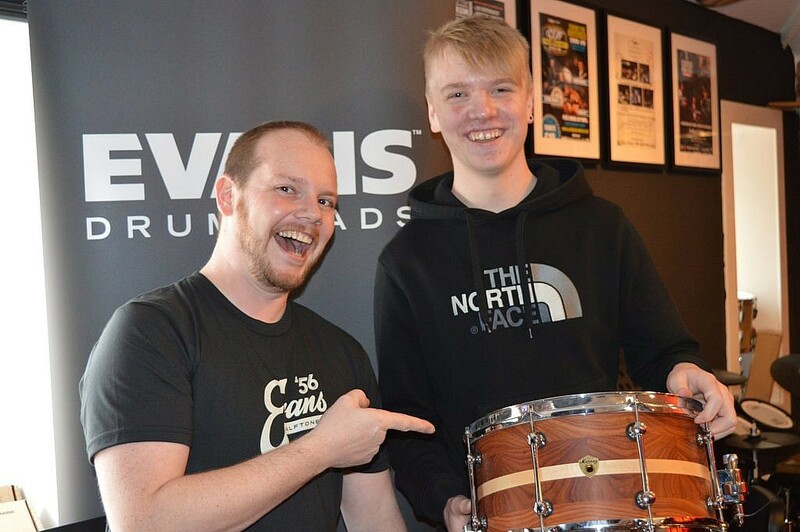 Ben had a special treat for me also when he completely reheaded my beloved ‘Big Ruby’ Sonor Phonic Kit in Evans Hydraulics leaving her sounding monstrous and even more gorgeous as a Redhead! Rory and Ben with the awesome sounding Murray Drum. Kaz himself hung out lots in the shop adding to the vibe and enjoying the coffee. He was keen also to display his talents to all who ventured in and out including some amazing playing on Big Ruby. So after a 2 hour switch around we transformed our wee shop into an intimate venue once more and set up Kaz’s Tama kit for the main course. Our Evening with Kaz Rodriguez was also sold to capacity and quite a few of the weekends previous attendees were back for more knowing what was in store! What followed was the most jaw dropping, inspiring, entertaining and warm night of drumming you could imagine. Kaz played his heart out and was visibly loving every minute as much as the rest of us. As he played us through some of his most well know tracks and even gave us exclusive premiere of a few new tracks and collaborations not released yet. Amazing. Kaz shared everything, answered every question, signed every autograph book (including mine!) and made sure everyone got the photo they wanted. All this at 10pm on day 3 too! 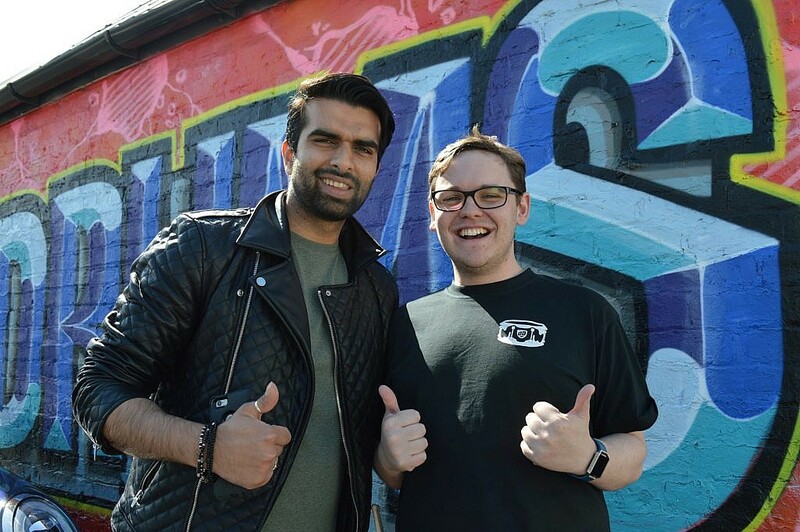 – Kaz had started teaching at 10 am that morning and had never stopped since his arrival! The social media storm that started around dD Drums that night and all week to be honest has been incredible. There is no doubt in my mind that Kaz is a very special person and player. 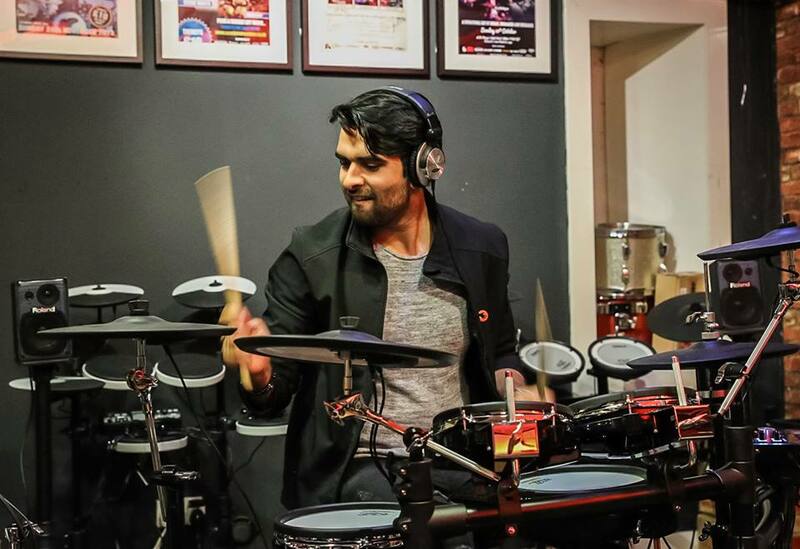 His rise to serious global prominence on the drum scene has been a pleasure to watch and is very well deserved. I previously thought it was inevitable that this would happen and I’m delighted to be right. Kaz left everyone lit up with something genuine to enhance their playing (and Life!) and we’re SO grateful you came all the way up to see us in Bonnie Scotland! Cheers to all my great customers for participating, supporting and keeping up the demand for events of this calibre. Without you there is nothing. Massive thanks to Kaz , Phil, John from Roland Electronic Drums and Ben from Evans Drumheads. 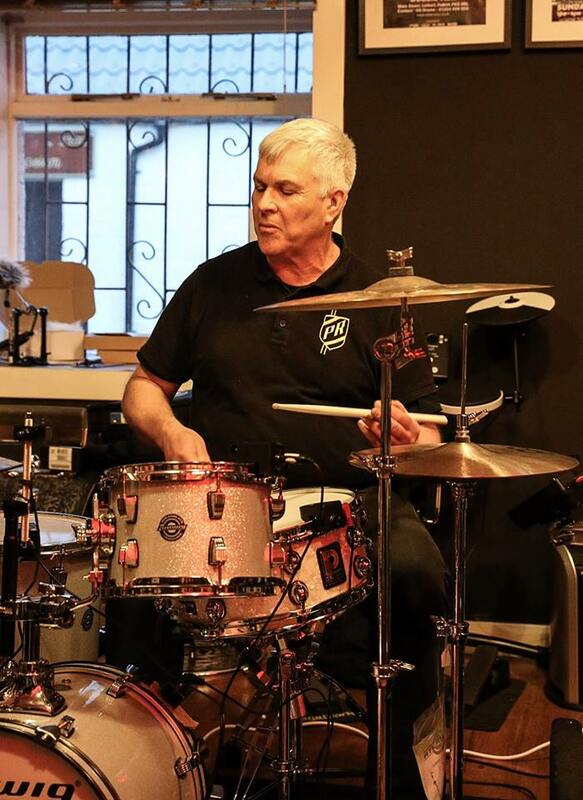 Your support of dD Drums and the dD Gang is 2nd to none and I thank you personally and on behalf of our growing drummer community. 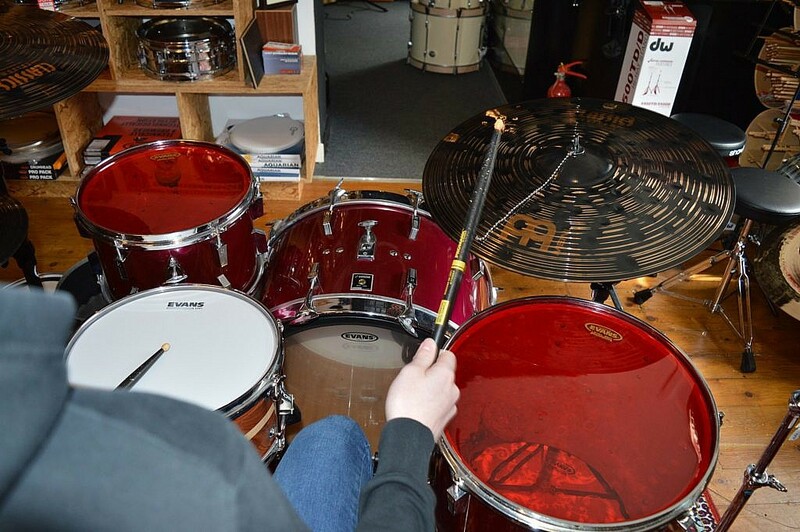 It’s fantastic to host all of this at dD Drums! Thanks to all for keeping Scotlands Funkiest Wee Drum Shop Funky! If you’d like any further information on dD Drums and our events such as this please subscribe to our Newsletter and I’ll keep you in the loop! * Special thanks to Stewart Kerr for his great pictures.